두견은 아시아 동부, 중국 동북부, 일본 등지에 번식하며 동남아시아에서 월동한다. 우리나라에서는 드문 여름철새로 전국의 저지대 산림에서 확인된다. 뻐꾸기와 유사하지만 줄무늬가 굵고 몸길이가 24∼28cm 내외로 뻐꾸기보다 작다. 두견(杜鵑)은 중국에서 망제의 한이 서려있는 새로 불여귀(不如歸), 두백(杜魄), 촉혼(蜀魂), 두우(杜宇), 자규(子規) 등 수십가지로 불려지고 있다. 한국에서도 귀촉도(歸蜀道)나 임금새 등으로 불리기도 한다. 김시습의 ＂불여귀＂, 두보의 ＂두견행＂, 서거정의 ＂불여귀거＂ 등 다수 시제에 소재가 된 새이며, 단종의 자규시로도 유명하다. 하지만 소쩍새와 자주 혼동되어 사용되었으며, 지금도 많은 사람들이 소쩍새와 혼동하고 있다. 두견은 독특한 울음소리로 인해 사람들에게 가장 잘 알려진 새 중에 하나이며, 서정적인 감흥을 불러일으키는 새이다. 한시에 가장 많이 등장하는 새이며, 사람들에 따라 들리는 소리가 달라 여러 가지 설화가 있기도 하다. 하지만 최근에 탁란(托卵)하는 휘파람새 등이 크게 감소하고, 저지대 산림이 외래 인공림으로 바뀌고, 먹이원인 곤충이 크게 감소하면서 우리 귀에서 울음소리가 사라지고 있는 새이다. 두견은 비교적 드문 여름새이긴 하였으나, 최근에 한국에 도래하는 뻐꾸기류 중에서 가장 많이 감소하여 천연기념물로 지정·보호하고 있다. The lesser cuckoo (Cuculus poliocephalus) breeds in Eastern Asia, Northeastern China, and Japan and winters in Southeast Asia. As a rare summer migratory bird in Korea, it has been sighted in low-lying forest areas. It is similar to the cuckoo but has thick stripes and smaller size at 24-28cm. In China, the lesser cuckoo is said to be the reincarnation of legendary Emperor Du Yu, going by many different names including “duyu.” In Korea, it is also called “imgeumsae” (king bird) In both countries, the bird is the subject of many poems by writers such as Kim Si-seup and Seo Geo-jeong and Du Fu from China and is also mentioned in King Danjong’s “Jagyusi,” a poem that expresses the king’s feelings while in exile. Note, however, that the lesser cuckoo is commonly confused with the Chinese scops owl. 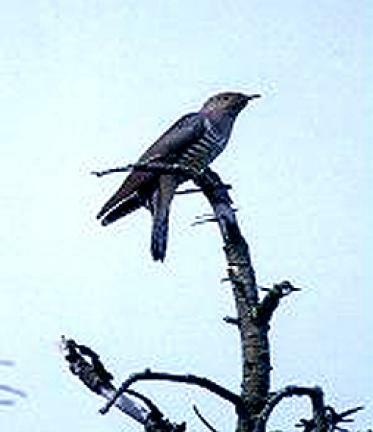 The lesser cuckoo is a well-known bird because of its unique sound, which evokes an emotional response in people. The bird is mentioned most frequently in old poems and is also the subject of various legends because everyone seems to hear the sound differently. These days, the number of birds that lay eggs in the nests of other birds is decreasing; the natural forests are being turned into man-made parks, and the insect population is rapidly declining. Thus, it is difficult to hear the song of the lesser cuckoo. Of the cuckoo birds that come to Korea, the lesser cuckoo is the species that is decreasing the most; for its protection, it is designated as a Natural Monument.